An American Expat in Turkey. Witness my struggles with the Turkish language and my love affair with the food. While my parents were here they wanted to head up north as well. My mom did not want to make plans or reservations, just to play the adventure by ear. So one day we hopped in the car and drove north towards the Black Sea. We stopped in Safranbolu, a UNESCO World Heritage Site, known for its well preserved Ottoman-era houses and architecture. We had a lovely time. We stopped and had a bite to eat at small cafe and then explored town. Yes, in this photo I am on the phone. I had checked for local hotels and was calling to see if there was room for the night. And there was! 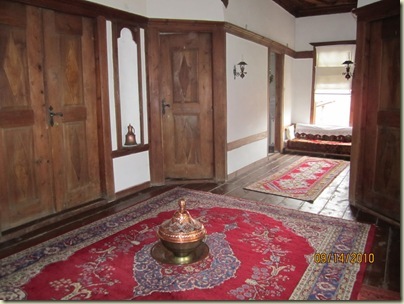 We stayed at Mehves Hanim Konagi, it was a lovely old Ottoman Style house, wonderfully refurbished. The proprietor was great. Since it was just my parents and me we thought we could share a large room. However, since there was no room with 3 beds (only cots for children) she gave us two rooms for the price of one. Later we hiked all around town. There is a large covered pazar which sells all kinds of goods. Above the city on a hill there is a small park. For a lira admission you can go in and see a panoramic view of the whole town. Up on the far side you may be able to see a large yellow building. That is a restored Ottoman mansion, which is now a museum. 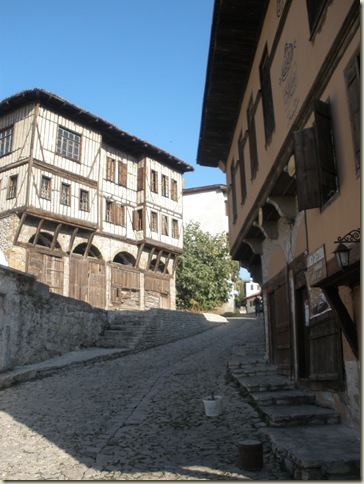 The museum hosts photos and examples of Safranbolu’s history and culture, though all the explanations are in Turkish. It also has a gallery of local women’s art work. 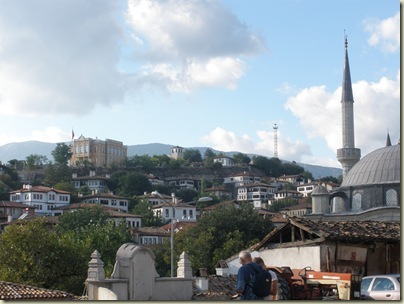 After exploring Safranbolu a little morn the next morning we headed off in the morning to the next town on our list. While it was not too far on the map, it took us longer to reach Amasra than we had thought. Between the construction, the one-lane bridges and the mountain passes without guardrails it was an exciting drive. More on that later. 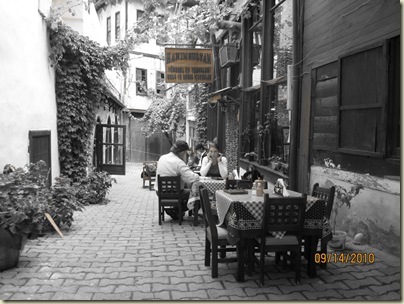 This entry was posted in Amasra, Black Sea, FamFam, Family, Road Trip, Safranbolu, Turkey and tagged Expat, Turkey by Jules. Bookmark the permalink.